So, now that I have bored you enough with overview, libraries, analysis options, and inspection, finally I'm getting to the point of it all: Building better Playlists. At the core of playlist creation stands a concept. Something that is supposed to make the list tick. Something that ties it all together. This can be something as common as "Best Rock of the 80ies", "Love Songs of 68", as personal as "Songs you made out to as Teenager" or as specialized as "Songs influenced by Nirvana's Nevermind". Or, if you're into working out "Driving Beats for Aerobics", "Steady Steps for Marathon Trance", and "Up and Down on two Wheels". You get the idea. The point here is, every one of these concepts follows different rules and therefore requires different data. Regarding data we're in luck. Analysis and Inspection should have whipped your collection in shape. But how do you find the right songs? 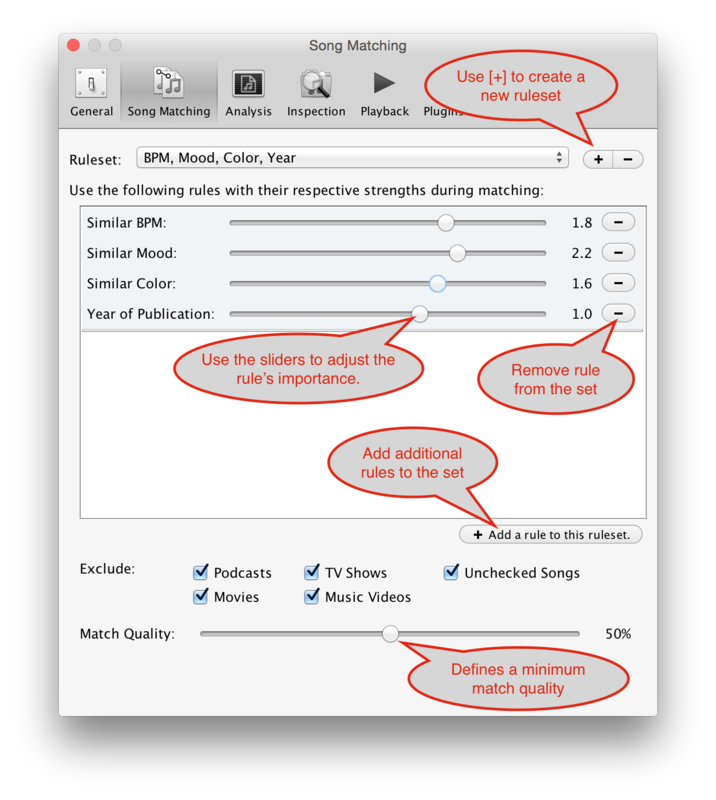 How do you make beaTunes understand the rules? Naturally, you can simply browse your library or use the filter field to search, build your lists completely manually. Another approach is called query by example. The idea is, that you choose a song and ask beaTunes to find a similar one. The $100.000 question is: What exactly is similar? beaTunes sidesteps this question by letting you define what's important to you. This happens in the Song Matching preferences. There you can set up sets of rules that emphasize certain aspects of similarity, like tempo, mood, or color. Once you have created a ruleset appropriate for the playlist you want to create, select a song that the other songs are supposed to be similar to. This song is called a seed song. Then choose New Matchlist from the File menu (or use the corresponding toolbar button). 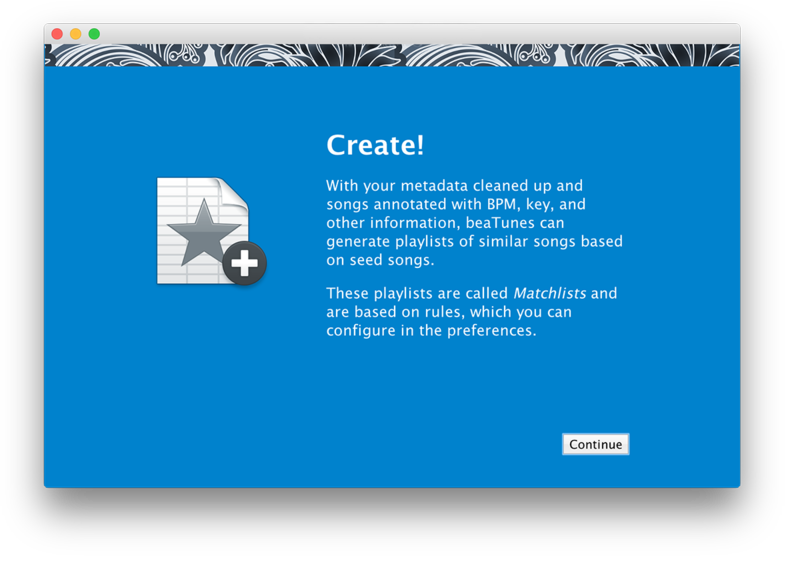 beaTunes will then display the dialog shown below. Once you click OK, it will automatically create a new playlist according to the configured rules. Matchlist are a great tool for building playlists with the click of a button. But they also take all the fun out of the creative process. beaTunes supports another way to create playlists, one that works song-by-song. To get started, again select a song that you want to use as the first song of your list—your opener. Then click on New Playlist from Selection in the File menu. beaTunes will create a new playlist and you might want to change the default name to something better. Then select that very first, lonely song, open the View menu, and make sure that Show Matching Songs is turned on. Below the main playlist table, a panel with matching songs should appear. To build your playlist, check out the matching songs. 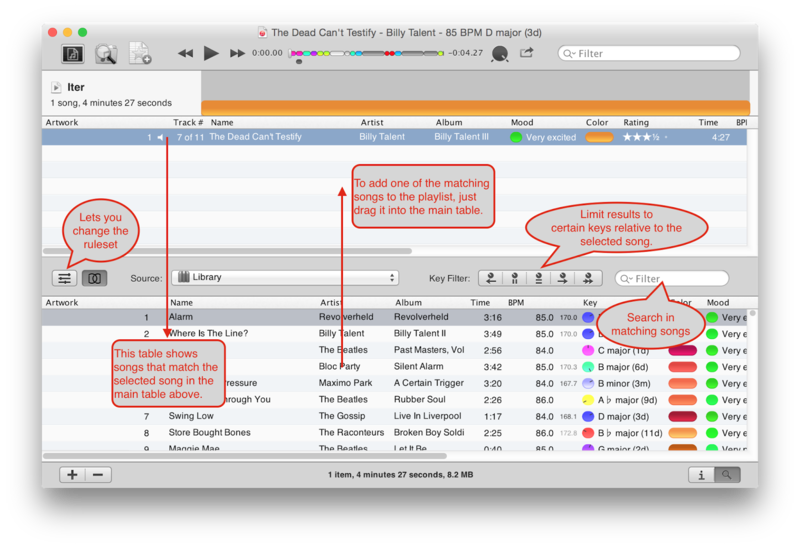 Once you've found a good candidate for song #2, simply drag it into the main playlist table above. 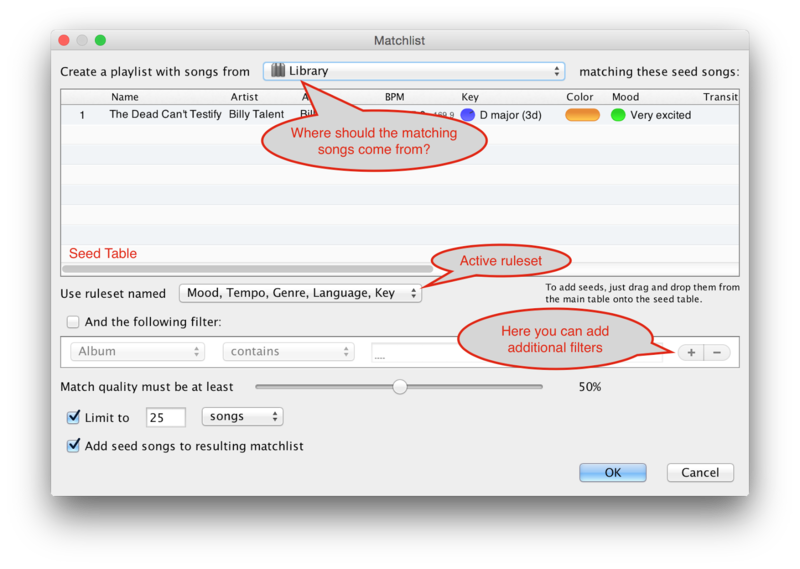 You will find that beaTunes automatically selects the newly added song, triggering the match process again. So now, beaTunes shows you potential candidates for song #3. And so on... The process is also nicely demonstrated in this video. If you're unhappy with the current match ruleset, you can select another or modify the current one in the preferences. And for those people interested in harmonic mixing, I'd like to point out the key filters. They let you hide songs that are not in a defined harmonic relationship to the selected song. I hope this articles helped you getting the most out of beaTunes when creating playlists. If you have further questions, please comment below or start a discussion in the support forum.